Pining for a bird’s eye view of the world but have a terrible fear of flying? There’s no need for a boarding pass with these exquisite rugs from Florian Pucher. These limited edition rugs are hand tufted in New Zealand wool for the Land Carpet Collection and are truly unlike anything I’ve ever seen (apart from, of course, a real aerial view from a plane window). I can’t honestly say if this is more art than floor covering. Either way, Florian Pucher truly has found the sweet spot where both worlds manage to meet and be functional. 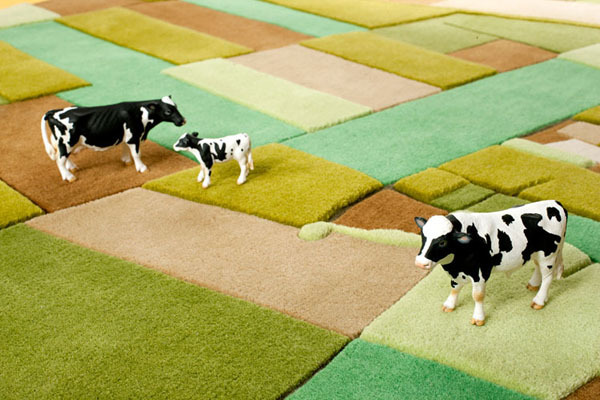 The Land Carpet Collection consists of aerial views of four countries – Europe, Africa, Netherlands and the USA. All four rugs are beautiful and would take pride of place wherever they reside. I love the Netherlands rug myself with its patches of violet, grey, green and shades of blue but at US$2100 I don’t see it coming to rest on my living room floor anytime soon! Available from Florian Pucher, Land Carpet Collection rugs start from US$1200.